I'm trying to do two different things with replays and stringers. But none of them are working . First, we would like to have a replay with a stringer at the begining and at the end. With replay template, we manage to have the first stringer but not at the end. In fact, if a test a reply template with the replay clip first and then the stringer clip, that not works either. It is the same issue if I test with two stringer clips and then playing the replay clip. Is that the propert work or is any problem with Soft? Can you post an example of the Replay Template? Perhaps this is something we need to investigate. When we have a movie following the replay clip, it's like nothing was there... And it happens the same if we have two clips before the replay clip. Only one clip is played and then the replay clip. Maria Palotes Stingers are transitions so i don't think they're intended to work that way. A Replay Template is a Replay shot with layers, not a sequence with a transition in / transition out. Maria Palotes Perhaps you can build the Replay Template which seems to give you the transition in and add it to a Playlist since the Playlist can also have a transition. we've already use a stringer transition! I think we tried with playlist but we were'nt able to have the replay clip inside the playlist every moment. Maria Palotes Do make a Feature Request explaining how you'd like to work more easily. Sometimes after developing a feature, we find the users want to use it in ways we didn't anticipate. 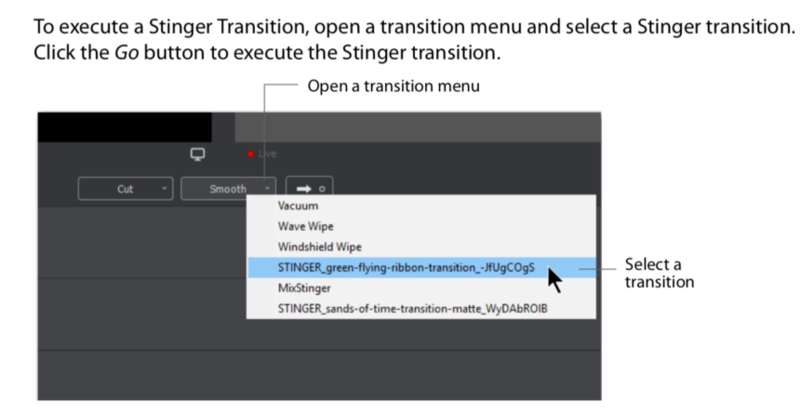 Fill out the form and make the request explaining how you'd like separate Stinger Transition In and Out of a Replay shot or Replay Template.